Title: London, Westminster and Southwark as in the Olden Times, shewing the city, and its suburbs with the churches, monasteries and all the important buildings as they stood in the reign of Henry VIII before the Reformation. London: William Newton & Bell & Daldy. A large bird's-eye plan of early 16th century London, with the important buildings shown in profile, and a huge 436-point key of landmarks. Complete with the book (without loss). Newton compiled the map from a number of sources, including the Braun & Hogenberg and the 'Agas' maps. The elevation of the Norman St Paul's cathedral is copied from the etching by Wenceslas Hollar, showing the building before the spire was destroyed by lightning in 1561. 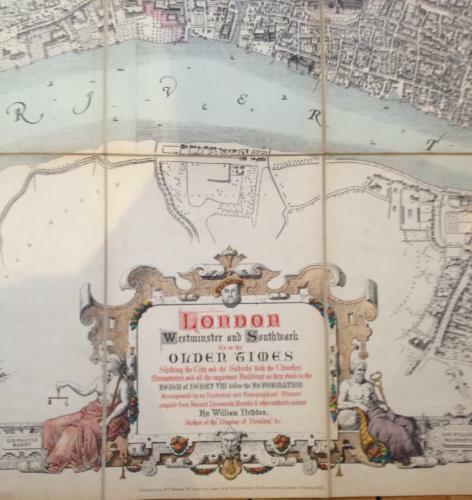 Shows London in Tudor times and the area destroyed by the Great Fire of London in 1666.